There is a lot people use to discribe me. I am many things to a lot of people. But as to my path I am a Pagan Witch.. Earth being my element of power. I teach and have taught many paths. I am a healer, reader, and medium. On the mundane side of life I am a mother of a beautiful 2yr old little girl. I am a college student and a writer by hobby. AVE.. Flying by on a whim & a wing, felt guided to offer you are A OK..
"Wishing you blue skies & gentle winds.. To Reflect"
Merry Meet! 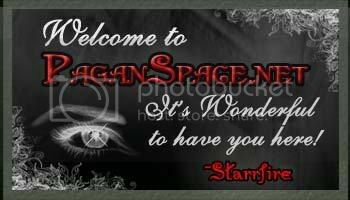 Welcome to Paganspace. I hope you enjoy it here.